The action resumed after a day's break in the Vizag leg of the competition as the inter zone challenge week came to an end. Dabang Delhi KC took to the mat against fellow Zone A side U Mumba at the Rajiv Gandhi Indoor Stadium in the port city of Vishakhapatnam. Dabang Delhi came into this match on the brink of four wins in a row at their home leg and within touching distance of securing a playoffs spot from Zone A. They needed just one point from the match to secure their top three finish in the standings. 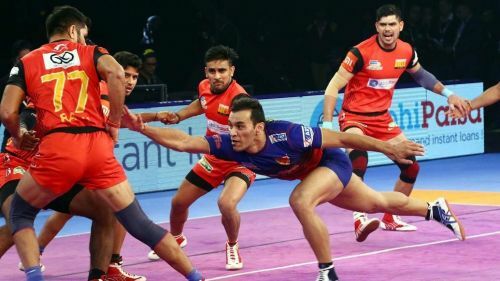 U Mumba had also won four in a row but was already safely into the playoffs but hoped to maintain the pole position in the standings of Zone A.
Delhi went into the match with a complete overhaul of their lineup as their stalwarts Joginder Narwal, Vishal Mane, and Ravinder Pahal all rested with Naveen Kumar starting on the bench. U Mumba deployed their regular starting lineup with the addition of Darshan Kadian as they went with three raiders led by Siddharth Desai. The first half of the period saw the U Mumba side take control of proceedings from the starting buzzer as the raiders were calculated in their approach and their defence was ruthless. Fazel Atrachali starred with three tackle points from the left corner as Surender Singh and Dharmaraj Cheralathan contributed with a couple of tackle points. Delhi's defence also looked in good touch as Satpal Narwal raced to four tackle points with a strong Super Tackle on Siddharth Desai and Vishal Lather added two more tackle points to their tally. The half ended with U Mumba leading 19-11 on the scoreboard. The second period of the match saw U Mumba carry on the momentum as both their defence and attack exerted control on the mat and it was one-way traffic all the way. U Mumba went on to win the match with a huge margin of twenty-five points as the scoreboard read 44-19 in the end. The former U Mumba raider led the Dabang Delhi KC side tonight in the absence of Joginder Narwal. He had a fairly decent match picking up five raid points. Satpal Narwal played on the right corner for Delhi and looked solid with his ankle holds and picked up four tackle points including one Super Tackle. The cover defender was a good support to his fellow defenders but failed to pick up a tackle point in his first start of the season for the Dabang Delhi side. The young defender started off the match on a strong note with a block on Siddharth Desai and picked up two points in the first half. The left corner did well to pick up two tackle points in the first half with his timely dashes. He had a quiet second half failing to add to his tally. The Iranian all-rounder had a quiet first half as he failed to pick up a raid point in the first half and was tackled a couple of times. He was replaced in the second half by Yogesh Hooda. The young all-rounder came off the bench a couple of times but did not have any success with points against a stubborn U Mumba defence.